We’d love your help. Let us know what’s wrong with this preview of Starting Missional Churches by Mark Lau Branson. To ask other readers questions about Starting Missional Churches, please sign up. OK, not the best, mostly theoretical, but certainly not the worst. Still insightful and contains some nuggets. “The Church Is A Sign, Foretaste, Witness And Instrument Of The In-Breaking Of God” (182). American church planting has reached its zenith. An industry in itself, church planting has become the mission statement of some denominations present in North America (e.g. the Southern Baptist Convention). In anticipation of the many methods practiced by these church planters, Starting Missional Churches: Life with God in the Neighborhood offers an important vocalization of a new missions-minded church pl “The Church Is A Sign, Foretaste, Witness And Instrument Of The In-Breaking Of God” (182). American church planting has reached its zenith. An industry in itself, church planting has become the mission statement of some denominations present in North America (e.g. the Southern Baptist Convention). In anticipation of the many methods practiced by these church planters, Starting Missional Churches: Life with God in the Neighborhood offers an important vocalization of a new missions-minded church planting movement. Instead of treating America as a field of harvesting, the authors of Missional Churches demonstrate a story of American church planting that places “missions” at the front of the church’s worldview. Based on the presupposition that America is a mission field in which God is already at work (9-10), the “collection of stories” (11) constituting Missional Churches addresses the neighborhood as the church’s mission field. Missional Churches begins and ends with pragmatic explanations of what missional churches in fact are. Chapters 1 and 2 set the stage for how these neighborhood-centered churches differ from traditional SPEC (“Suburban Sprawl,” “Protestant Splitting,” “Expert Strategies,” and “Charismatic Figure”) strategies (14-27). In opposition to SPEC, these authors and pastors seek to “engage this changing American environment as a mission field” (27). Involved in this missional approach are priorities such as viewing one’s “neighbor as subject” instead of an object (e.g. demographic) and intentional “boundary crossing” (e.g. not setting up “your church”). Whereas SPEC strategies support founding a church to reach a certain type of people (e.g. lifestyle, worship style, social status, etc. 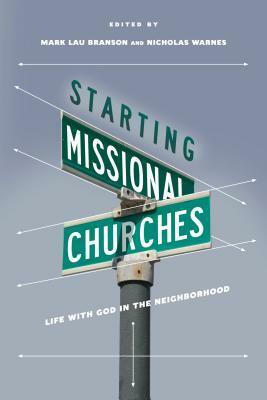 ), the missional approach calls the church to focus on the neighborhood and people that surround them (57, 68, 105, 124). Written from a spectrum of different denominational situations and theological traditions (e.g. Baptist, Presbyterian, Charismatic and non-denominational), the co-authors of Missional Churches demonstrate the fluid approaches and applications that can develop within this missional mindset. Presented as “stories” (11) of growing churches, each chapter brings something unique to the volume. Some distinctions will make individuals in other traditions uncomfortable, but ultimately they work to show the committed application of missions in America. Without tip-off, the “stories” standout chapters include those by Craig Brown (chapter 4), Nikki Collins MacMillian (chapter 6), and AJ Swoboda (chapter 8). In conclusion, Missional Churches presses on the future of the church and convicts concerning its planting procedures. Although the authors push the conservative evangelical church’s proverbial envelope, these stories press individuals of every denomination and belief to pursue Christ and His kingdom in America’s neighborhoods. Pastors, planters, and ministry workers will benefit from engaging the authors and ideas presented both in their abstract and incarnational forms. p.47 Four priorities when planting a church:"God is the primary agent, neighbors are subjects, boundary crossing is essential, and leadership is plural." p.50 "Because God is inherently social and missional, church is ultimately about relationship and connection, where the community is the apologetic of faith witnessed through love for one another." p.145 "Even if our church was 'different,' it will still die someday. Every church will. It's humbling to acknowledge that not one of the churches Pau p.47 Four priorities when planting a church:"God is the primary agent, neighbors are subjects, boundary crossing is essential, and leadership is plural." Helpful. I like reading about real life examples of churches that are trying to participate in God's movement already at work in their contexts. There were ideas and practices that I could use to inform and shape my own church work. The theological reflection piece from the authors felt less accessible. But the main idea that churches are called to follow God's vision rather than set a vision and try to get God to bless it was a useful one. So good. Very honest and real. Nick Warnes is on to something big here. Are you interested in impacting your community? Start here.